BROOKSIDE BRIDGES high and low in the Boeck backyard. The stream that gives its name to “Brookside” starts in the Hollywood Hills and ultimately makes its way to Ballona Creek and the Pacific Ocean. The land in this area originally was granted in 1823 to Don Francisco José Avila (who, in 1810-1811, was the alcalde, or mayor, of Los Angeles) and became known as the Rancho Las Cienegas (Ranch of the Marshland). The youngest of the children of Don Francisco and his wife, the former Maria del Rosaria Verdugo, was Francisca. Francisca married a German immigrant named Theodore Rimpau. Then, after the Civil War, they moved south to live in the German colony of Anaheim, but retained their Rancho Las Cienegas. In the early 1920s, with the regular westward expansion of Los Angeles from Downtown and the success of the Fremont Place and Windsor Square subdivisions, the Rimpau Estate Company sold a portion of the rancho bounded by Fremont Place, Olympic Blvd. (then Country Club Drive), Highland Avenue and Wilshire Blvd. for subdivision into lots of varied sizes; larger, luxurious lots for two-story homes on the west and smaller lots, generally built upon with one-story bungalows, on the east. Because these parcels have their high ground on both sides of the creek, efficient utilization of the lots required a way to get from one side of the creek to the other in each backyard. 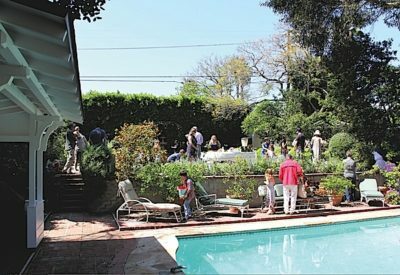 In the block between 9th St. and Olympic Blvd., some houses have a lawn and play area across their bridges on the west side of the creek; one has a pool and garden across its bridge, and one even has a theater (the famous “Brookledge Theater” of the Larsen family of magicians) crossing the creek. EGG HUNT and neighborhood party on the west side of the brook in the Boeck backyard in Brookside. The Bill and Sandy Boeck property is one with a pool and garden on the far side of their two bridges. 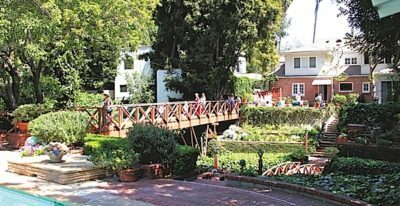 Because their slopes on both sides of the creek also are beautifully landscaped, there are paths and a short, arched bridge down at the lower level. A long, straight bridge connects the patio behind the house directly with the swimming pool and expansive lawn to the west. It is said that Mr. and Mrs. Earl at one time owned not only their Brookside house, but also the house and lot to its south and the abutting lot on Olympic Blvd., to the west of the creek. Sandy Boeck has been in residence at this beautiful house, with its historic bridges, since buying the property from the Earls in 1973. 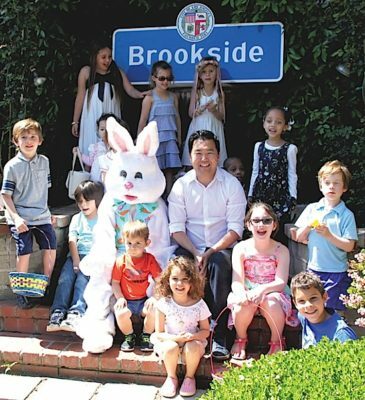 EASTER BUNNY and Councilman David Ryu pose with Brookside children after the annual egg hunt. The Boecks have maintained the historic property and its expansive gardens, pool, and lawn for the enjoyment of family and friends. It has been on that lawn and in the shrubs and other hiding places that the Brookside Easter Bunny has hidden eggs in recent years. Children from the neighborhood have gathered for an annual party, and the Easter Bunny’s elected representative, Councilmember David Ryu, has joined the egg hunt festivities as well. Right by two of the historic bridges of Brookside.